I recently received a starter pack from the lovely folk at 180 Nutrition. The company has a range of both whey and vegan protein supplements. Their vegan protein was recommended to me by a friend so I was very keen to try it and subsequently not disappointed. Here is the low-down. What's different about 180's supplement compared to regular protein powders? I tried the chocolate and coconut flavours. Throwing it in the blender with my soy milk and some banana and frozen berries, they were very pleasant tasting with a subtle coconutty or chocolatty flavour. I like that you can see what some of the ingredients are in the powder such as the whole chia and sesame seeds. As its free from artificial bulking agents and thickeners, it feels light to drink and doesn't give you a gluggy feeling like you just ate a thick shake. Of course, if you wanted to make it thicker, you could just go right ahead and add more chia seeds or linseeds yourself but the good folk at 180 have left that up to the individual. Firstly, you can check out their website at www.180nutrition.com.au for a more detailed description of the company and their products but I think a good place to start is the 'starter pack' which comes with free postage. 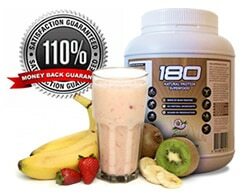 180 nutrition also has a crazy 110% money back gaurantee if you're not satisfied with their product! 180 Nutrition are very passionate about what they do and have created a pure, protein and health supplement for the sporty, the healthy, the food sensitive and whole family alike. Thumbs up! If you struggling to get back into shape, then you must read this 5 Tips That will make You Stay Fit & Smart article to know to facts about leading a healthier lifestyle.